Jatwada is a small village in Aurangabad district of Maharashtra. It is at a distance of about 18 km from the city of Aurangabad. It is on the way to Ajanta caves from Aurangabad. Jatwada is known for a Jain temple it hosts. This Jain temple is dedicated to the 23rd Tirthankara of Jaina tradition. The 23rd Tirthankara is known as Parsvanatha who lived around 8th and 7th century BC. He was the last but one Tirthankara, and Mahavir Jain happens to be the 24th Tirthankara. Parsvanatha belonged to a Royal clan from Varanasi (son of King Ashvasena and Queen Vama). He took up the Path of Jaina ascetic tradition after completing 30 years as a nobleman. Legends say that he was very kind and was an adored man of many. There are many temples of Parsvanatha (with at least 108 different images) in India. The Jatwada Jain temple (Aurangabad) is one among them. The image of Parsvanatha in Jatwada is known as Kalikund Digambar Chintamani. 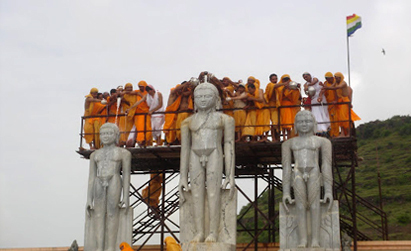 The devotees who wish to have a pilgrimage around Jain temples near Aurangabad can visit temples situated at these spots: Ellora, Jatwada, Kachner, and Paithan. Ellora is 21 km away from Aurangabad; Aurangabad to Ellora takes 18 km drive; from Jatwada you can go to Kachner (48 km); and from Kachner you can go to Paithan (33 km).